This article is about the book. For other uses, see Harry Potter and the Philosopher's Stone (disambiguation). Harry Potter and the Philosopher's Stone is a fantasy novel written by British author J. K. Rowling. The first novel in the Harry Potter series and Rowling's debut novel, it follows Harry Potter, a young wizard who discovers his magical heritage on his eleventh birthday, when he receives a letter of acceptance to Hogwarts School of Witchcraft and Wizardry. Harry makes close friends and a few enemies during his first year at the school, and with the help of his friends, Harry faces an attempted comeback by the dark wizard Lord Voldemort, who killed Harry's parents, but failed to kill Harry when he was just 15 months old. The book was first published in the United Kingdom in 1997 by Bloomsbury. It was published in the United States the following year by Scholastic Corporation under the title Harry Potter and the Sorcerer's Stone. It won most of the British book awards that were judged by children and other awards in the US. The book reached the top of the New York Times list of best-selling fiction in August 1999 and stayed near the top of that list for much of 1999 and 2000. It has been translated into at least 73 other languages, and has been made into a feature-length film of the same name, as have all six of its sequels. Most reviews were very favourable, commenting on Rowling's imagination, humour, simple, direct style and clever plot construction, although a few complained that the final chapters seemed rushed. The writing has been compared to that of Jane Austen, one of Rowling's favourite authors; Roald Dahl, whose works dominated children's stories before the appearance of Harry Potter; and the Ancient Greek story-teller Homer. While some commentators thought the book looked backwards to Victorian and Edwardian boarding school stories, others thought it placed the genre firmly in the modern world by featuring contemporary ethical and social issues, as well as overcoming obstacles like bullies. Harry Potter and the Philosopher's Stone, along with the rest of the Harry Potter series, has been attacked by some religious groups and banned in some countries because of accusations that the novels promote witchcraft under the guise of a heroic, moral story. Other religious commentators have written that the book exemplifies important viewpoints, including the power of self-sacrifice and the ways in which people's decisions shape their personalities. The series has been used as a source of object lessons in educational techniques, sociological analysis and marketing. Harry Potter has been living an ordinary life, constantly abused by his surly and cold aunt and uncle, Vernon and Petunia Dursley and bullied by their spoiled son Dudley since the death of his parents ten years prior. His life changes on the day of his eleventh birthday when he receives a letter of acceptance into Hogwarts School of Witchcraft and Wizardry, delivered by a half-giant named Rubeus Hagrid after previous letters had been destroyed by Harry's Uncle Vernon and his Aunt Petunia. Hagrid explains Harry's hidden past as the wizard son of James and Lily Potter, who were a wizard and witch respectively, and how they were murdered by the most evil and powerful dark wizard of all time, Lord Voldemort, which resulted in the one-year-old Harry being sent to live with his aunt and uncle. Somehow Voldemort was unable to kill Harry, but instead had his own powers removed and blasted away, sparking Harry's immense fame among the magical community. Hagrid introduces Harry to the wizarding world, bringing him to places such as Diagon Alley, a hidden London street where Harry gets his owl Hedwig and various school supplies, and Gringotts Wizarding Bank, where he uncovers a fortune left to him by his parents in his vault. There, he is surprised to discover how famous he truly is among witches and wizards. A month later, Harry leaves the Dursleys' home to catch the Hogwarts Express from King's Cross railway station's secret Hogwarts platform, Platform ​9 3⁄4. On the train, he quickly befriends fellow first-year Ronald Weasley and Hermione Granger, whose snobbiness and affinity for spells initially causes the two boys to dislike her. There, Harry also makes an enemy of yet another first-year, Draco Malfoy, who shows prejudice against Ron for his family's financial difficulties. Arriving at Hogwarts, the first-years are assigned by the magical Sorting Hat to Houses that best suit their personalities, the four Houses being Gryffindor, Slytherin, Hufflepuff and Ravenclaw. Harry hears from Ron about Slytherin's dark reputation which is known to house potential dark witches and wizards, and thus objects to being sorted into Slytherin despite the Hat claiming that Harry has potential to develop under that House. He winds up in Gryffindor with Ron and Hermione, while Draco is sorted into Slytherin like his whole family before him. As classes begin at Hogwarts, Harry discovers his innate talent for flying on broomsticks despite no prior experience, and is recruited into his House's Quidditch (a competitive wizards' sport played in the air) team as a Seeker. He also comes to dislike the school's Potions master, Severus Snape, who is also the Head of Slytherin House who acts with bias in favour of members of his House while perpetually looking for opportunities to fail Harry and his friends. Malfoy tricks Harry and Ron into a duel in the trophy room to get them out of their rooms at night and secretly tells Filch, the school's caretaker, where they will be. Hermione unintentionally is forced to come along after her attempts to stop them fail. Harry, Ron, and Hermione then find Gryffindor student Neville asleep outside the common area because he had forgotten the password to get in. After realizing the duel was a set-up to get them in trouble, they run away. They then discover a huge three-headed dog standing guard over a trapdoor in a forbidden corridor. The school year is interrupted by the entrance of a troll into the school, which enters the girls' bathroom where Hermione was. However she is saved by Harry and Ron and, as a result, Hermione is grateful and the three become best friends. Coupled with Snape's recent leg injury as well as behaviour, the recent events prompt Harry, Hermione and Ron to suspect him to be looking for a way to enter the trapdoor. Hermione forbids the boys from investigating for fear of expulsion, and instead makes Harry direct his attention to his first ever Quidditch game, where his broomstick begins to lose control and threatens to throw him off. This leads Hermione to suspect that Snape is jinxing Harry's broom due to his strange behaviour during the match. After the excitement of winning the match has died down, Christmas approaches and Harry receives an invisibility cloak from an anonymous source claiming that the cloak belonged to Harry's father. Using the cloak to explore the school at night to investigate the possibility of what is under the trapdoor, he discovers the Mirror of Erised, in which the viewer sees his or her deepest desires come true. A visit to Hagrid's cottage at the foot of the school leads the trio to find a newspaper report stating there had been an attempted robbery of a Gringotts vault—the same vault that Hagrid and Harry had visited when Harry was getting his school supplies. A further indiscretion from Hagrid allows them to work out that the object kept under that trapdoor is a Philosopher's Stone, which grants its user immortality as well as the ability to turn any metal into pure gold. Harry is also informed by a centaur named Firenze in the forest that a plot to steal the Stone is being orchestrated by none other than Voldemort himself, who schemes to use it to be restored back to his body and return to power. When the school's headmaster Albus Dumbledore is lured from Hogwarts under false pretences, Harry, Hermione and Ron fear that the theft is imminent and descend through the trapdoor themselves. They encounter a series of obstacles, each of which requires unique skills possessed by one of the three, and one of which requires Ron to sacrifice himself in a life-sized game of wizard's chess. In the final room, Harry, now alone, finds Quirinus Quirrell, the Defence Against the Dark Arts teacher, who had been the one working behind the scenes to kill Harry by first jinxing his broom and then letting a troll into the school. Snape had been trying to protect Harry instead, who had wronged him. Now, Quirrell is partly possessed by Voldemort, whose face has sprouted on the back of Quirrell's head but is constantly concealed by his oversized turban. Voldemort needs Harry's help to get past the final obstacle: the Mirror of Erised, forcing him to stand before the Mirror. It recognises Harry's lack of greed for the Stone and surreptitiously deposits it into his pocket. As Quirrell attempts to seize the stone and kill Harry, his flesh burns on contact with the boy's skin and breaks into blisters. Harry's scar suddenly burns with pain, and he passes into unconsciousness. Three days later, he awakens in the school's infirmary, where Dumbledore explains his survival against Voldemort to be owed to his mother's sacrificing her life in order for him to live, leaving a powerful protective charm on Harry that lives in his blood, burning Quirrell, who was possessed by hatred and greed. He also reveals himself as the one who sent Harry his father's invisibility cloak, while Quirrell has been left to die by Voldemort and the Stone has now been destroyed. The eventful school year ends at the final feast, during which Gryffindor wins the House Cup. Harry returns to Privet Drive for the summer, neglecting to tell the Dursleys that the use of spells is forbidden by under-aged wizards and witches and thus anticipating some fun and peace over the holidays. Harry Potter is an orphan whom Rowling imagined as a "scrawny, black-haired, green eyed and bespectacled boy who didn't know he was a wizard." She developed the series' story and characters to explain how Harry came to be in this situation and how his life unfolded from there. Apart from the first chapter, the events of this book take place just before and in the year following Harry's eleventh birthday. Voldemort's attack left a lightning bolt-shaped scar on Harry's forehead, which produces stabbing pains whenever Voldemort is present. Harry has a natural talent for Quidditch and became the first person in decades to get on their team in their first year. Ronald Weasley is Harry's age and Rowling describes him as the ultimate best friend, "always there when you need him." He is freckled, red-haired and quite tall. He grew up in a fairly large pure-blood family as the sixth born of seven children. Although his family is quite poor, they still live comfortably and happily. His loyalty and bravery in the face of a game of Wizards Chess plays a vital part in finding the Philosopher's Stone. Hermione Granger, the daughter of an all-Muggle family, is a bossy girl who has apparently memorised most of the textbooks before the start of term. Rowling described Hermione as a "very logical, upright and good" character with "a lot of insecurity and a great fear of failure beneath her swottiness". Despite her nagging efforts to keep Harry and Ron out of trouble, she becomes a close friend of the two boys after they save her from a troll, and her magical and analytical skills play an important role in finding the Philosopher's Stone. She has bushy brown hair and rather large front teeth. Neville Longbottom is a plump, diffident boy, so forgetful that his grandmother gives him a Remembrall, although he cannot remember why. Neville's magical abilities are weak and appeared just in time to save his life when he was eight. Despite his timidity, Neville will fight anyone after some encouragement or if he thinks it is right and important. Rubeus Hagrid, a half-giant nearly 12 feet (3.7 m) tall, with tangled black hair and beard, was expelled from Hogwarts and his wand was snapped in half (resulting in him never to use a wand again), however Professor Dumbledore let him stay on as the school's gamekeeper, a job which enables him to lavish affection, care and even pet names on even the most dangerous of magical creatures. Hagrid is fiercely loyal to Dumbledore and quickly becomes a close friend of Harry, Ron and, later, Hermione, but his carelessness makes him unreliable. Professor Albus Dumbledore, a tall, thin man who wears half-moon spectacles and has silver hair and a beard that tucks into his belt, is the headmaster of Hogwarts, and thought to be the only wizard Voldemort fears. Dumbledore, while renowned for his achievements in magic, shrugs off praise, though he is aware of his own brilliance. Rowling described him as the "epitome of goodness". Professor Minerva McGonagall, a tall, severe-looking woman with black hair tied in a tight bun, teaches Transfiguration, and is able to transform herself into a cat. She is Deputy Headmistress, and Head of Gryffindor House and, according to the author, "under that gruff exterior" is "a bit of an old softy". Petunia Dursley, the sister of Harry's mother Lily, is a thin woman with a long neck that she uses for spying on the neighbours. As a muggle, she regards her magical sister as a freak and tries to pretend that she never existed. Vernon Dursley, the husband of Petunia Dursley, is a heavily built man whose irascible bluster covers a narrow mind and a fear of anything unusual. Dudley Dursley is an overweight, spoiled bully and Harry's cousin. Draco Malfoy is a slim, pale boy who speaks in a bored drawl. He is arrogant about his skill in Quidditch, and despises anyone who is not a pure-blood wizard – and wizards who do not share his views. His parents had supported Voldemort, but changed sides after the dark wizard's disappearance, claiming they had been bewitched. Draco avoids direct confrontations, and tries to get Harry and his friends into trouble. Oliver Wood is Harry's Quidditch captain and keeper for the Gryffindor Quidditch team. Professor Quirrell is a twitching, stammering and nervous man who teaches Defence Against the Dark Arts. Reputedly he was a brilliant scholar, but his nerve was shattered by an encounter with vampires. Quirrell wears a turban to conceal the fact that he is voluntarily possessed by Voldemort, whose face appears on the back of Quirrell's head. Professor Severus Snape, who has a hooked nose, sallow complexion and greasy black hair, teaches Potions, but would prefer to teach Defence Against the Dark Arts. Snape praises pupils in Slytherin, his own House but seizes every opportunity to humiliate others, especially Harry. Several incidents, beginning with the shooting pain in Harry's scar during the start-of-term feast, lead Harry and his friends to think Snape is a follower of Voldemort. Argus Filch, the school caretaker who knows the school's secret passages better than anyone else except, possibly, the Weasley twins. His cat, Mrs. Norris, aids his constant hunt for misbehaving pupils. Other members of staff include the dumpy Herbology teacher and Head of Hufflepuff House Professor Sprout, Professor Flitwick, the tiny and excitable Charms teacher, and Head of Ravenclaw House, the soporific History of Magic teacher, Professor Binns, a ghost who does not seem to have noticed his own death; and Madam Hooch, the Quidditch coach, who is strict, but a considerate and methodical teacher. The poltergeist Peeves wanders around the castle causing trouble wherever he can. In the book, Rowling introduces an eclectic cast of characters. The first character to be introduced is Vernon Dursley, Harry's uncle. Most of the actions centre on the eponymous hero Harry Potter, an orphan who escapes his miserable childhood with the Dursley family. Rowling imagined him as a "scrawny, black-haired, bespectacled boy who didn't know he was a wizard", and says she transferred part of her pain about losing her mother to him. During the book, Harry makes two close friends, Ronald Weasley and Hermione Granger. Ron is described by Rowling as the ultimate best friend, "always there when you need him". Rowling has described Hermione as a "very logical, upright and good" character with "a lot of insecurity and a great fear of failure beneath her swottiness". Rowling also imagined a supporting cast of adults. The headmaster of Hogwarts is the powerful, but kind wizard Albus Dumbledore, who becomes Harry's confidant. Rowling described him as "epitome of goodness". His right hand is severe Minerva McGonagall, who according to the author "under that gruff exterior" is "a bit of an old softy", the friendly half-giant Rubeus Hagrid, who saved Harry from the Dursley family, and the sinister Severus Snape. Professor Quirrell is also featured in the novel. The basic idea... Harry, I saw Harry very very very clearly. Very vividly. And I knew he didn't know he was a wizard. [...] And so then I kind of worked backwards from that position to find out how that could be, that he wouldn't know what he was. [...] When he was one year old, the most evil wizard for hundreds and hundreds of years attempted to kill him. He killed Harry's parents, and then he tried to kill Harry—he tried to curse him. [...] And—so—but for some mysterious reason, the curse didn't work on Harry. So he's left with this lightning bolt shaped scar on his forehead and the curse rebounded upon the evil wizard, who has been in hiding ever since. The book, which was Rowling's debut novel, was written between approximately June 1990 and some time in 1995. In 1990 Jo Rowling, as she preferred to be known,[a] wanted to move with her boyfriend to a flat in Manchester and in her words, "One weekend after flat hunting, I took the train back to London on my own and the idea for Harry Potter fell into my head... A scrawny, little, black-haired, bespectacled boy became more and more of a wizard to me... I began to write Philosopher's Stone that very evening. Although, the first couple of pages look nothing like the finished product." Then Rowling's mother died and, to cope with her pain, Rowling transferred her own anguish to the orphan Harry. Rowling spent six years working on Harry Potter and the Philosopher's Stone, and after it was accepted by Bloomsbury, she obtained a grant of £8,000 from the Scottish Arts Council, which enabled her to plan the sequels. She sent the book to an agent and a publisher, and then the second agent she approached spent a year trying to sell the book to publishers, most of whom thought it was too long at about 90,000 words. Barry Cunningham, who was building a portfolio of distinctive fantasies by new authors for Bloomsbury Children's Books, recommended accepting the book, and the eight-year-old daughter of Bloomsbury's chief executive said it was "so much better than anything else". Bloomsbury accepted the book, paying Rowling a £2,500 advance, and Cunningham sent proof copies to carefully chosen authors, critics and booksellers in order to obtain comments that could be quoted when the book was launched. He was less concerned about the book's length than about its author's name, since the title sounded like a boys' book to him, and he believed boys preferred books by male authors. Rowling therefore adopted the nom de plume J.K. Rowling just before publication. In June 1997, Bloomsbury published Philosopher's Stone with an initial print-run of 500 copies in hardback, three hundred of which were distributed to libraries. Her original name, "Joanne Rowling", can be found in small print on the copyright page of this first British edition. (The 1998 first American edition would remove reference to "Joanne" completely.) The short initial print run was standard for first novels, and Cunningham hoped booksellers would read the book and recommend it to customers. Examples from this initial print run have sold for as much as US$33,460 in a 2007 Heritage Auction. Lindsey Fraser, who had previously supplied one of the blurb comments, wrote what is thought to be the first published review, in The Scotsman on 28 June 1997. She described Harry Potter and the Philosopher's Stone as "a hugely entertaining thriller" and Rowling as "a first-rate writer for children". Another early review, in The Herald, said, "I have yet to find a child who can put it down." Newspapers outside Scotland started to notice the book, with glowing reviews in The Guardian, The Sunday Times and The Mail on Sunday, and in September 1997 Books for Keeps, a magazine that specialised in children's books, gave the novel four stars out of five. The Mail on Sunday rated it as "the most imaginative debut since Roald Dahl"; a view echoed by the Sunday Times ("comparisons to Dahl are, this time, justified"), while The Guardian called it "a richly textured novel given lift-off by an inventive wit" and The Scotsman said it had "all the makings of a classic". In 1997 the UK edition won a National Book Award and a gold medal in the 9- to 11-year-olds category of the Nestlé Smarties Book Prize. The Smarties award, which is voted for by children, made the book well known within six months of publication, while most children's books have to wait for years. The following year, Philosopher's Stone won almost all the other major British awards that were decided by children. [b] It was also shortlisted for children's books awards adjudicated by adults, but did not win. Sandra Beckett commented that books which were popular with children were regarded as undemanding and as not of the highest literary standards – for example the literary establishment disdained the works of Dahl, an overwhelming favourite of children before the appearance of Rowling's books. In 2003, the novel was listed at number 22 on the BBC's survey The Big Read. Harry Potter and the Philosopher's Stone won two publishing industry awards given for sales rather than literary merit, the British Book Awards Children's Book of the Year and the Booksellers' Association / Bookseller Author of the Year. By March 1999 UK editions had sold just over 300,000 copies, and the story was still the UK's best-selling title in December 2001. A Braille edition was published in May 1998 by the Scottish Braille Press. 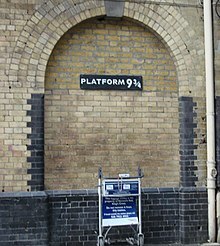 Platform ​9 3⁄4, from which the Hogwarts Express left London, was commemorated in the real-life King's Cross railway station with a sign and a trolley apparently passing through the wall. Scholastic Corporation bought the U.S. rights at the Bologna Book Fair in April 1997 for US$105,000, an unusually high sum for a children's book. Scholastic's Arthur Levine thought that "philosopher" sounded too archaic for readers and after some discussion (including the proposed title "Harry Potter and the School of Magic"), the American edition was published in September 1998 under the title Rowling suggested, Harry Potter and the Sorcerer's Stone. Rowling later said that she regretted this change and would have fought it if she had been in a stronger position at the time. Philip Nel has pointed out that the change lost the connection with alchemy, and the meaning of some other terms changed in translation, for example from "crumpet" to "muffin". While Rowling accepted the change from both the British English "mum" and Seamus Finnigan's Irish variant "mam" to "mom" in Harry Potter and the Sorcerer's Stone, she vetoed this change in the later books, which was then reversed in later editions of Philosopher's Stone. However, Nel considered that Scholastic's translations were considerably more sensitive than most of those imposed on British English books of the time, and that some other changes could be regarded as useful copyedits. Since the British editions of early titles in the series were published months prior to the American versions, some American readers became familiar with the British English versions due to buying them from online retailers. At first the most prestigious reviewers ignored the book, leaving it to book trade and library publications such as Kirkus Reviews and Booklist, which examined it only by the entertainment-oriented criteria of children's fiction. However, more penetrating specialist reviews (such as one by Cooperative Children's Book Center Choices, which pointed out the complexity, depth and consistency of the world that Rowling had built) attracted the attention of reviewers in major newspapers. Although The Boston Globe and Michael Winerip in The New York Times complained that the final chapters were the weakest part of the book, they and most other American reviewers gave glowing praise. A year later, the US edition was selected as an American Library Association Notable Book, a Publishers Weekly Best Book of 1998, and a New York Public Library 1998 Best Book of the Year, and won Parenting Magazine's Book of the Year Award for 1998, the School Library Journal Best Book of the Year, and the American Library Association Best Book for Young Adults. 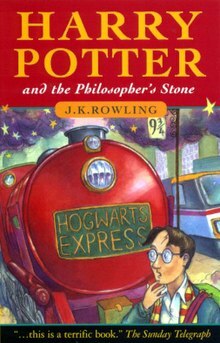 In August 1999, Harry Potter and the Sorcerer's Stone topped the New York Times list of best-selling fiction, and stayed near the top of the list for much of 1999 and 2000, until the New York Times split its list into children's and adult sections under pressure from other publishers who were eager to see their books given higher placings. Publishers Weekly's report in December 2001 on cumulative sales of children's fiction placed Harry Potter and the Sorcerer's Stone 19th among hardbacks (over 5 million copies) and 7th among paperbacks (over 6.6 million copies). In May 2008, Scholastic announced the creation of a 10th Anniversary Edition of the book that was released on 1 October 2008 to mark the tenth anniversary of the original American release. For the fifteenth anniversary of the books, Scholastic re-released Sorcerer's Stone, along with the other six novels in the series, with new cover art by Kazu Kibuishi in 2013. By mid-2008, official translations of the book had been published in 67 languages. By November 2017, the book had been translated into 80 languages, the 80th being Lowland Scots. It was translated by Matthew Fitt, who said that he was honoured to be the Scots translator, and that he "wanted to do it for a long time". The translation is considered significant by Heart, who described it as "probably the most incredible version so far", The Guardian, who believed that it "may just be the best of all", and Stylist. Bloomsbury have published translations in Latin and in Ancient Greek, and the latter was described as "one of the most important pieces of Ancient Greek prose written in many centuries". Some reviewers compared Philosopher's Stone to the stories of Roald Dahl, who died in 1990. Many writers since the 1970s had been hailed as his successor, but none had attained anything near his popularity with children and, in a poll conducted shortly after the launch of Philosopher's Stone, seven of the ten most popular children's books were by Dahl, including the one in top place. The only other really popular children's author of the late 1990s was an American, R. L. Stine. Some of the story elements in Philosopher's Stone resembled parts of Dahl's stories. For example, the hero of James and the Giant Peach lost his parents and had to live with a pair of unpleasant aunts‍—‌one fat and one thin rather like Mr. and Mrs. Dursley, who treated Harry as a servant. However Harry Potter was a distinctive creation, able to take on the responsibilities of an adult while remaining a child inside. Librarian Nancy Knapp and marketing professor Stephen Brown noted the liveliness and detail of descriptions, especially of shop scenes such as Diagon Alley. Tad Brennan commented that Rowling's writing resembles that of Homer: "rapid, plain, and direct in expression." Stephen King admired "the sort of playful details of which only British fantasists seem capable" and concluded that they worked because Rowling enjoys a quick giggle and then moves briskly forward. Nicholas Tucker described the early Harry Potter books as looking back to Victorian and Edwardian children's stories: Hogwarts was an old-style boarding school in which the teachers addressed pupils formally by their surnames and were most concerned with the reputations of the houses with which they were associated; characters' personalities were plainly shown by their appearances, starting with the Dursleys; evil or malicious characters were to be crushed rather than reformed, including Filch's cat Mrs Norris; and the hero, a mistreated orphan who found his true place in life, was charismatic and good at sports, but considerate and protective towards the weak. Several other commentators have stated that the books present a highly stratified society including many social stereotypes. However Karin Westerman drew parallels with 1990s Britain: a class system that was breaking down but defended by those whose power and status it upheld; the multi-ethnic composition of Hogwarts' students; the racial tensions between the various intelligent species; and school bullying. Susan Hall wrote that there is no rule of law in the books, as the actions of Ministry of Magic officials are unconstrained by laws, accountability or any kind of legal challenge. This provides an opportunity for Voldemort to offer his own horrific version of order. As a side-effect Harry and Hermione, who were brought up in the highly regulated Muggle world, find solutions by thinking in ways unfamiliar to wizards. For example, Hermione notes that one obstacle to finding the Philosopher's Stone is a test of logic rather than magical power, and that most wizards have no chance of solving it. The second book, Harry Potter and the Chamber of Secrets, was originally published in the UK on July 2, 1998 and later, in the US on June 2, 1999. Harry Potter and the Prisoner of Azkaban was then published a year later in the UK on July 8, 1999 and in the US on September 8, 1999. Harry Potter and the Goblet of Fire was published on 8 July 2000 at the same time by Bloomsbury and Scholastic. Harry Potter and the Order of the Phoenix is the longest book in the series at 766 pages in the UK version and 870 pages in the US version. It was published worldwide in English on June 21, 2003. Harry Potter and the Half-Blood Prince was published on July 16, 2005 and sold 11 million copies in the first 24 hours of its worldwide release. The seventh and final novel, Harry Potter and the Deathly Hallows, was published on July 21, 2007. The book sold 11 million copies within 24 hours of its release: 2.7 million copies in the UK and 8.3 million in the US. An illustrated version of Harry Potter and the Philosopher's Stone was released on October 6, 2015, with illustrations by Jim Kay. The book carries over 100 illustrations and will be followed by illustrated versions of all seven books from the series by the same artist. In 1999, Rowling sold the film rights of the first four Harry Potter books to Warner Bros. for a reported £1 million ($1.65 million in 1999). Rowling demanded that the principal cast be kept strictly British but allowed for the casting of Irish actors such as the late Richard Harris as Dumbledore and of foreign actors as characters of the same nationalities in later books. After extensive casting, filming began in September 2000 at Leavesden Film Studios and in London, with production ending in July 2001. Harry Potter and the Philosopher's Stone was released in London on 14 November 2001. Reviewers' comments were positive, as reflected by an 80% Fresh rating on Rotten Tomatoes and by a score of 64% at Metacritic, representing "generally favourable reviews". Writers on education and business subjects have used the book as an object lesson. Writing about clinical teaching in medical schools, Jennifer Conn contrasted Snape's technical expertise with his intimidating behaviour towards students. Quidditch coach Madam Hooch on the other hand, illustrated useful techniques in the teaching of physical skills, including breaking down complex actions into sequences of simple ones and helping students to avoid common errors. Joyce Fields wrote that the books illustrate four of the five main topics in a typical first-year sociology class: "sociological concepts including culture, society, and socialisation; stratification and social inequality; social institutions; and social theory". Stephen Brown noted that the early Harry Potter books, especially Harry Potter and the Philosopher's Stone, were a runaway success despite inadequate and poorly organised marketing. Brown advised marketing executives to be less preoccupied with rigorous statistical analyses and the "analysis, planning, implementation, and control" model of management. Instead he recommended that they should treat the stories as "a marketing masterclass", full of enticing products and brand names. For example, a real-world analogue of Bertie Bott's Every Flavour Beans was introduced under licence in 2000 by toymaker Hasbro. ^ J.K. Rowling was christened Joanne Rowling, without a middle name, and adopted the nom de plume J.K. Rowling for publication. She says that she was always known as "Jo" The book's copyright page gives her name as "Joanne Rowling". ^ The Children's Book Award, The Young Telegraph Paperback of the Year Award, the Birmingham Cable Children's Book Award and the Sheffield Children's Book Award. ^ "Harry Potter and the Philosopher's Stone: J.K. Rowling: Bloomsbury Childrens". Bloomsbury. Archived from the original on 26 June 2015. Retrieved 26 June 2015. ^ a b "J.K. Rowling Official Site: Biography". J.K. Rowling. 2007. Archived from the original on 17 December 2008. Retrieved 11 January 2009. ^ a b c Rowling, J.K. (20 October 1999). "Interview with J.K. Rowling". The Diane Rehm Show (Interview). Interviewed by Diane Rehm. Washington: Accio Quote. Archived from the original on 30 July 2007. Retrieved 2 March 2009 – via WAMU. I saw Harry very very very clearly ... And I knew he didn't know he was a wizard ... And so then I kind of worked backwards from that position to find out how that could be, that he wouldn't know what he was... When he was one year old, the most evil wizard for hundreds and hundreds of years attempted to kill him. He killed Harry's parents, and then he tried to kill Harry ... but for some mysterious reason, the curse didn't work on Harry. So he's left with this lightning bolt-shaped scar on his forehead and the curse rebounded upon the evil wizard, Voldemort, who has been in hiding ever since. ^ a b "Harry Potter and Me". Accio Quote. Archived from the original on 5 March 2007. Retrieved 1 August 2013. ^ a b c d Fraser, Lindsey (15 August 2004). "J.K. Rowling at the Edinburgh Book Festival". Accio Quote. Archived from the original on 25 October 2007. Retrieved 12 January 2009. ^ a b Solomon, Evan (13 July 2000). "J.K. Rowling Interview". CBCNewsWorld Hot Type. Accio Quote. Archived from the original on 23 April 2011. Retrieved 12 January 2009. ^ a b "About the Books: transcript of J.K. Rowling's live interview on Scholastic.com". Scholastic.com. Accio Quote. 16 October 2000. Archived from the original on 23 April 2011. Retrieved 12 January 2009. ^ a b c Riccio, Heather (1995–2009). "Interview with JK Rowling, Author of Harry Potter". Hilary Magazine. Archived from the original on 31 January 2009. Retrieved 12 January 2009. ^ "Lydon, Christopher. J.K. Rowling interview transcript". The Connection (WBUR Radio). Accio Quote. 12 October 1999. Archived from the original on 6 August 2012. Retrieved 12 January 2009. ^ Lydon, Christopher (12 October 1999). "J.K. Rowling interview transcript". The Connection. Accio Quote. Archived from the original on 6 August 2012. Retrieved 22 January 2009. ^ a b "BBC "Red Nose Day" Online Chat Transcript". BBC. MuggleNet. 12 March 2001. Archived from the original on 14 December 2013. Retrieved 2 August 2013. ^ Rogers, Shelagh (23 October 2000). "Interview: J.K. Rowling". This Morning. Accio Quote. Archived from the original on 15 December 2013. Retrieved 3 August 2013. ^ Rowling, J.K. (1997). Harry Potter and the Philosopher's Stone. Bloomsbury. p. copyright notice. ISBN 978-0-7475-3274-3. ^ Kirk, Connie Ann (1 January 2003). "Early Career". J.K. Rowling: A Biography. Greenwood Publishing Group. p. 62. ISBN 978-0313322051. Retrieved 14 March 2014. ^ a b c d e f g h i j k l m n o p Eccleshare, Julia (2002). "The Publishing of a Phenomenon". A guide to the Harry Potter novels. Continuum International. pp. 7–14. ISBN 978-0-8264-5317-4. Retrieved 15 May 2009. ^ "Revealed: the eight-year-old girl who saved Harry Potter". The Independent. London. 3 July 2005. Archived from the original on 6 December 2013. Retrieved 20 May 2009. ^ Lawless, John (29 May 2005). "Nigel Newton". Bloomberg Businessweek. McGraw-Hill. Archived from the original on 27 August 2006. Retrieved 9 September 2006. ^ Elisco, Lester. "The Phenomenon of Harry Potter". TomFolio.com. Archived from the original on 12 April 2017. Retrieved 22 January 2009. ^ "Harry Potter and the Mystery of the Author's Name". Cotsen Children's Library. Princeton University. 15 September 2014. Archived from the original on 14 October 2014. Retrieved 16 September 2014. ^ "J.K. Rowling: The Rare True First Edition of the First Harry Potter Book, Harry Potter and the Philosopher's Stone". Heritage Auctions. 26 October 2007. Archived from the original on 5 May 2009. Retrieved 9 September 2010. ^ a b c d e f Nel, Philip (2001). "Reviews of the Novels". J.K. Rowling's Harry Potter novels: a reader's guide. Continuum International. pp. 53–55. ISBN 978-0-8264-5232-0. Archived from the original on 13 November 2013. Retrieved 15 May 2009. ^ a b c Knapp, N.F. (2003). "In Defense of Harry Potter: An Apologia" (PDF). School Libraries Worldwide. International Association of School Librarianship. 9 (1): 78–91. Archived from the original (PDF) on 9 March 2011. Retrieved 14 May 2009. ^ "Awards". Arthur A. Levine Books. Archived from the original on 29 April 2006. Retrieved 21 May 2006. ^ a b Beckett, Sandra L. (2008). "Child-to-Adult Crossover Fiction". Crossover Fiction. Taylor & Francis. pp. 112–115. ISBN 978-0-415-98033-3. Retrieved 16 May 2009. ^ "Children's Books: Bestsellers". The Independent. UK. 27 March 1999. Archived from the original on 4 August 2009. Retrieved 16 May 2009. ^ Jury, J. (22 December 2001). "Harry Potter hides fall in number of books sold a downturn in book sales". The Independent. London. Archived from the original on 7 July 2010. Retrieved 16 May 2009. ^ Thomas, Scott (2007). The Making of the Potterverse: A Month-by-Month Look at Harry's First 10 Years. ECW Press. p. 5. ISBN 978-1-55022-763-5. Retrieved 28 May 2009. ^ "Platform alteration for Hogwarts Express as King's Cross upgrade steps up a gear". London: Network Rail. 17 February 2009. Archived from the original on 22 July 2012. Retrieved 15 May 2009. ^ a b Nel, Philip (2004). "You Say "Jelly", I Say "Jell-O"?". In Whited, Lana A. (ed.). The ivory tower and Harry Potter. University of Missouri Press. pp. 261–269. ISBN 978-0-8262-1549-9. Retrieved 15 May 2009. ^ "Differences in the UK and US Versions of Four Harry Potter Books". University of Tampere. 7 May 2010. Archived from the original on 19 March 2015. Retrieved 17 August 2008. ^ Gumm, Callum (August 2018). "Why is it Harry Potter and the Sorcerer's Stone and not the Philosopher's Stone?". Fansided. Retrieved 31 January 2019. ^ Grady, Constance (1 September 2018). "The first Harry Potter book wasn't perfect, but it was magic". Vox. Retrieved 31 January 2019. ^ "Meet Author J.K. Rowling". Scholastic Inc. Archived from the original on 12 December 2013. Retrieved 14 December 2013. ^ Cowell, Alan (18 October 1999). "Harry Potter and the Magic Stock; A Children's Book Series Helps Rejuvenate a British Publisher". The New York Times. Archived from the original on 4 August 2009. Retrieved 16 May 2009. ^ a b Unsworth, John M. "20th-Century American Bestsellers". UIUC Graduate School of Library and Information Science. Archived from the original on 20 August 2012. Retrieved 16 May 2009. ^ Winerip, Michael (14 February 1999). "Children's Books". The New York Times. Archived from the original on 9 December 2008. Retrieved 12 January 2009. ^ "New York Times Best Seller Number Ones Listing Fiction By Date". Hawes Publications. Archived from the original on 9 February 2009. Retrieved 16 May 2009. ^ "All-Time Bestselling Children's Books". Publishers Weekly. 248 (51). 17 December 2001. Archived from the original on 21 January 2013. Retrieved 22 January 2009. ^ a b "Scholastic Reveals Sorcerer's Stone Anniversary Edition". MuggleNet. 20 May 2008. Archived from the original on 31 May 2008. Retrieved 12 January 2009. ^ a b Rowling, J. K. (2008). Harry Potter and the Sorcerer's Stone, 10th Anniversary Edition. ISBN 978-0545069670. ^ Derschowitz, Jessica (13 February 2013). ""Harry Potter" gets new book covers for 15th anniversary". CBS News. CBS Interactive Inc. Archived from the original on 14 December 2013. Retrieved 14 December 2013. ^ "Scholastic Reveals New Book Cover For 'Harry Potter And The Sorcerer's Stone'". The Huffington Post. AOL Lifestyle. 13 February 2013. Archived from the original on 25 March 2014. Retrieved 14 December 2013. ^ Liu, Jonathan (13 February 2013). "New Harry Potter Covers by Kazu Kibuishi". Wired Magazine. Archived from the original on 5 January 2014. Retrieved 14 December 2013. ^ "Rowling 'makes £5 every second'". BBC. 3 October 2008. Archived from the original on 6 October 2008. Retrieved 17 October 2008. ^ Dammann, Guy (18 June 2008). "Harry Potter breaks 400m in sales". London: Guardian News and Media Limited. Archived from the original on 31 October 2013. Retrieved 17 October 2008. ^ BBC (10 November 2017). "First book in Harry Potter series translated into Scots". BBC News. Retrieved 28 March 2019. ^ a b Naomi Berners (22 January 2018). "There's A Scottish Edition Of Harry Potter And It's Got Everyone In Stitches". Heart. Retrieved 28 March 2019. ^ Peter Ross (21 November 2017). "Bizzumbaw and heidbummers: why Harry Potter and the Philosopher's Stone is better in Scots". The Guardian. Retrieved 28 March 2019. ^ Susan Devaney (2018). "A hilarious Scottish version of Harry Potter exists and people think it's magical". Stylist. Retrieved 28 March 2019. ^ Rowling, J.K.; Needham, P. (2003). 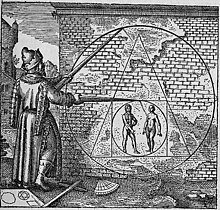 Harrius Potter et Philosophi Lapis (in Latin). Bloomsbury USA Children's Books. ISBN 978-1-58234-825-4. ^ Rowling, J.K.; Wilson, A. (2004). Άρειος Ποτηρ καὶ ἡ τοῦ φιλοσόφου λίθος (in Ancient Greek). Bloomsbury USA Children's Books. ISBN 978-1-58234-826-1. ^ a b Brennan, Tad (7 August 2005). "J. K. Rowling, Harry Potter and the Philosopher's Stone. Translated into Ancient Greek by Andrew Wilson". Bryn Mawr Classical Review. Bryn Mawr College. Archived from the original on 4 August 2009. Retrieved 16 May 2009. ^ a b Cockrell, Amanda (2004). "Harry Potter and the Secret Password". In Whited, Lana A. (ed.). The ivory tower and Harry Potter. University of Missouri Press. pp. 23–24. ISBN 978-0-8262-1549-9. Retrieved 15 May 2009. ^ a b c Brown, Stephen (2002). "Marketing for Muggles: The Harry Potter way to higher profits". Business Horizons. 45 (1): 6–14. doi:10.1016/S0007-6813(02)80004-0. ^ King, Stephen (23 July 2000). "Wild About Harry". The New York Times. Archived from the original on 9 August 2010. Retrieved 16 May 2009. ^ Tucker, Nicholas (December 1999). "The Rise and Rise of Harry Potter". Children's Literature in Education. 30 (4): 221–234. doi:10.1023/A:1022438704330. ^ a b Fields, Joyce W. (2007). "Harry Potter, Benjamin Bloom, and the Sociological Imagination" (PDF). International Journal of Teaching and Learning in Higher Education. 19 (2): 167–177. Archived (PDF) from the original on 18 August 2010. Retrieved 15 May 2009. ^ Westman, Karin E. (2004). "Specters of Thatcherism". In Whited, Lana A. (ed.). The ivory tower and Harry Potter. University of Missouri Press. pp. 306–308. ISBN 978-0-8262-1549-9. Retrieved 15 May 2009. ^ Hall, Susan (2003). "Harry Potter and the Rule of Law". In Anatol, Giselle Liza (ed.). Reading Harry Potter. Greenwood Publishing. pp. 147–162. ISBN 978-0-313-32067-5. Retrieved 15 May 2009. ^ a b "A Potter timeline for muggles". Toronto Star. 14 July 2007. Archived from the original on 20 December 2008. Retrieved 27 September 2008. ^ a b "Harry Potter: Meet J.K. Rowling". Scholastic Inc. Archived from the original on 22 August 2008. Retrieved 27 September 2008. ^ "Speed-reading after lights out". The Guardian. London: Guardian News and Media Limited. 19 July 2000. Archived from the original on 31 December 2013. Retrieved 27 September 2008. ^ "July date for Harry Potter book". BBC. 21 December 2004. Archived from the original on 29 December 2008. Retrieved 27 September 2008. ^ "Harry Potter finale sales hit 11 m". BBC News. 23 July 2007. Archived from the original on 25 December 2008. Retrieved 21 August 2008. ^ "Rowling unveils last Potter date". BBC. 1 February 2007. Archived from the original on 28 December 2008. Retrieved 27 September 2008. ^ "Harry Potter finale sales hit 11 m". BBC. 23 July 2007. Archived from the original on 25 December 2008. Retrieved 20 August 2008. ^ "Harry Potter and the Philosopher's Stone: Illustrated Edition". Bloomsbury Publishing. Archived from the original on 23 June 2017. Retrieved 26 December 2017. ^ De Vera, Ruel S. "Illustrated edition offers 'Harry Potter' fans a unique reading experience". lifestyle.inquirer.net. Archived from the original on 26 March 2017. Retrieved 25 March 2017. ^ "WiGBPd About Harry". The Australian Financial Review. Accio Quote. 19 July 2000. Archived from the original on 23 February 2011. Retrieved 26 May 2007. ^ "Harry Potter and the Philosopher's Stone". The Guardian. UK. 16 November 2001. Archived from the original on 30 September 2013. Retrieved 26 May 2007. ^ "Daniel Radcliffe, Rupert Grint and Emma Watson bring Harry, Ron and Hermione to life for Warner Bros. Pictures' 'Harry Potter and the Sorcerer's Stone'". Warner Brothers. 21 August 2000. Archived from the original on 4 April 2007. Retrieved 26 May 2007. ^ Schmitz, Greg Dean. "Harry Potter and the Sorcerer's Stone (2001)". Yahoo! Movies. Archived from the original on 29 May 2007. Retrieved 30 May 2007. ^ "Potter Casts Spell at World Premiere". BBC News. 15 November 2001. Archived from the original on 12 March 2007. Retrieved 23 September 2007. ^ Linder, Brian (17 May 2000). "Bewitched Warner Bros. Delays Potter". IGN. Archived from the original on 6 December 2008. Retrieved 8 July 2007. ^ "Harry Potter and the Sorcerer's Stone (2001)". Rotten Tomatoes. Archived from the original on 3 December 2013. Retrieved 8 July 2007. ^ "Harry Potter and the Sorcerer's Stone". Metacritic. Archived from the original on 11 July 2009. Retrieved 20 July 2007. ^ "Harry Potter and the Sorcerer's Stone for PC". GameRankings. Archived from the original on 5 July 2010. Retrieved 7 June 2010. ^ "Harry Potter and the Sorcerer's Stone (PC)". Metacritic. Archived from the original on 25 March 2011. Retrieved 26 May 2009. ^ "Harry Potter and the Sorcerer's Stone for PlayStation". GameRankings. Archived from the original on 6 September 2010. Retrieved 7 June 2010. ^ "Harry Potter and the Sorcerer's Stone (PSX)". Metacritic. Archived from the original on 23 November 2010. Retrieved 26 May 2009. ^ "Harry Potter and the Sorcerer's Stone for Game Boy Color". GameRankings. Archived from the original on 6 September 2010. Retrieved 7 June 2010. ^ "Harry Potter and the Sorcerer's Stone for Game Boy Advance". GameRankings. Archived from the original on 6 September 2010. Retrieved 7 June 2010. ^ "Potter and the Sorcerer's Stone (GBA)". Metacritic. Archived from the original on 14 July 2011. Retrieved 26 May 2009. ^ "Harry Potter and the Philosopher's Stone (Mac)". Future Publishing Limited. 15 April 2002. Archived from the original on 4 August 2009. Retrieved 25 May 2009. ^ "Harry Potter and the Sorcerer's Stone for GameCube". GameRankings. Archived from the original on 21 August 2010. Retrieved 7 June 2010. ^ "Harry Potter and the Sorcerer's Stone (Cube)". Metacritic. Archived from the original on 18 December 2010. Retrieved 26 May 2009. ^ "Harry Potter and the Sorcerer's Stone for PlayStation 2". GameRankings. Archived from the original on 6 September 2010. Retrieved 7 June 2010. ^ "Harry Potter and the Sorcerer's Stone (PS2)". Metacritic. Archived from the original on 18 October 2012. Retrieved 26 May 2009. ^ "Harry Potter and the Sorcerer's Stone for Xbox". GameRankings. Archived from the original on 6 September 2010. Retrieved 7 June 2010. ^ "Harry Potter and the Sorcerer's Stone (Xbox)". Metacritic. Archived from the original on 14 July 2011. Retrieved 26 May 2009. ^ Conn, Jennifer J. (2002). "What can clinical teachers learn from Harry Potter and the Philosopher's Stone?". Medical Education. 36 (12): 1176–1181. CiteSeerX 10.1.1.463.8854. doi:10.1046/j.1365-2923.2002.01376.x. PMID 12472752. ^ "Hasbro Wins Wide Range of Rights for Harry Potter from Warner Bros. Consumer Products". Burbank, California: Time Warner. 11 February 2000. Archived from the original on 29 October 2013. Retrieved 14 May 2009. ^ Harry Potter and the Philosopher's Stone British Children's Cloth Edition. ASIN 0747532699. ^ Harry Potter and Philosopher's Stone. ASIN 0747542988. ^ Harry Potter and the Philosopher's Stone: Deluxe Gift Edition. ASIN 0747545723. ^ Harry Potter and the Philosopher's Stone Children's Paperback Edition. ASIN 155192398X. ^ Harry Potter and the Philosopher's Stone (Magic Edition). ASIN 1551926121. ^ Harry Potter and the Philosopher's Stone (Book 1). ASIN 1551927284. ^ Harry Potter And The Philosopher's Stone. ASIN 0747574472. ^ Harry Potter And The Philosopher's Stone. ASIN 1408810549. ^ Harry Potter And The Philosopher's Stone. ASIN 1408834960. ^ Harry Potter and the Philosopher's Stone (Book 1). ASIN 0747532699. ^ Harry Potter and the Philosopher's Stone (Book 1). ASIN 0747532745. ^ Harry Potter and the Philosopher's Stone (Book 1). ASIN 0747542988. ^ Harry Potter and the Philosopher's Stone (Book 1). ASIN 0747545723. ^ Harry Potter and the Philosopher's Stone (Book 1). ASIN 0747558191. ^ Harry Potter and the Philosopher's Stone (Book 1). ASIN 0747574472. ^ Harry Potter and the Philosopher's Stone (Book 1). ASIN 0747573603. ^ Harry Potter and the Philosopher's Stone (Harry Potter Signature Edition). ASIN 1408810549. ^ Harry Potter and the Philosopher's Stone (Harry Potter 1 Adult Cover). ASIN 1408834960. ^ Harry Potter and the Philosopher's Stone (Illustrated Hardcover). ASIN 1408845644. ^ "Harry Potter and the Sorcerer's Stone". Kirkus Reviews. 1 September 1998. Archived from the original on 14 December 2013. Retrieved 14 December 2013. ^ Harry Potter and the Sorcerer's Stone (Book 1). ISBN 978-0590353427. ^ Rowling, J. K. (October 2000). Harry Potter and the Sorcerer's Stone. ISBN 978-0439203524. ^ Rowling, Joanne K. (1997). Harry Potter And The Sorcerer's Stone (mm). ISBN 978-0439362139. ^ "New cover for Sorcerer's Stone paperback edition". MuggleNet. 29 September 2008. Archived from the original on 5 December 2008. Retrieved 14 December 2013. ^ Harry Potter and the Sorcerer's Stone (Book 1). ISBN 978-0545582889. ^ Rowling, J. K. (2015). Harry Potter and the Sorcerer's Stone (Book 1). ISBN 978-0545790352.